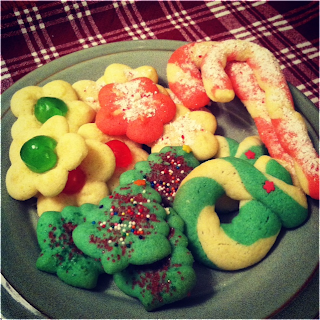 Christmas Day is over, but I'm still eating Christmas cookies galore. Last Saturday, the siblings and I got in the kitchen once more to bake up some Holiday Press Cookies (also known as Spritz). These buttery cookies are not too sweet and have a yummy punch of almond flavor. Like all the other cookies I've made this season, this is another family favorite and annual tradition. But this time it was extra special, because my brother paid us a visit from Big Sky Country. I can't remember the last time I celebrated Christmas with him, and having him in the kitchen baking cookies with my sister and me is a memory I'll never forget. In fact, he got us motivated and creative this time around. Instead of using just the Cookie Press for these, we made free-form wreaths and candy canes! Sift together the flour and baking powder. Cream the butter and add the sugar gradually and cream thoroughly. Beat in the egg and almond extract. You can use vanilla if you don't like almond flavoring. Gradually blend in the dry ingredients. Separate the dough into thirds so you can add the food coloring. One for green, one for red and the other is left plain. Chill the dough in the fridge for about 15 mins. This helps the dough to firm up a little so it will transfer through the cookie press easier. 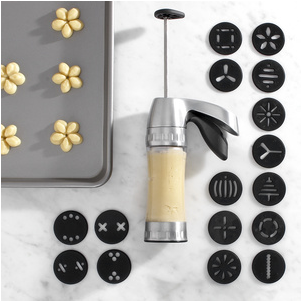 Attach your desired press pattern and fill the cookie press with the appropriate colored dough. Form the cookies on an ungreased cookie sheet about an inch apart. Decorate with the candies, sprinkles, etc. and bake for 10 mins in a 375 degrees oven. Makes about 6-7 doz. For candy canes: Roll out the dough into thin strips about 18 in long on a floured board. Place two colors together side by side and cut them into 3 in strips. Slightly pinch each strip together and roll them out into 6 in strips. Then twist the dough and mold it into a candy cane shape on the cookie sheet. Bake for 10 mins. Cool the cookies slightly and then add the crushed candy cane candy on top. Since the cookie press comes with a variety of shapes, you can use this recipe all year round, not just for the holidays! One of my friends makes candy cane cookies like those every year at Christmas, they're so yummy and pretty! p.s. i got your email and will be responding this afternoon!! Looking forward to it! I used to make these cookies with my mom when I was a little girl! :) We called them "spritz" cookies. Cute cookies! Thanks for sharing! I'm still enjoying Christmas treats!